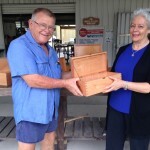 The Bribie Island woodwork group have offered to continue to make boxes for the women in the group, following on from the Memory Box project. These beautifully designed and crafted boxes have been made for us with willingness and generosity, and with a refusal of any reimbursement. They have told us that they all have been touched in some way by cancer, and are pleased to be able to do something for others. Each woman in the group has been given one of these boxes to keep, to use in whatever way she wishes. We are very grateful to the Woodies, in particular Kim Bowers, and pleased to have this alliance with these thoughtful and skilled craftsmen. The Memory Box Project grew out of connections the Advanced Breast Cancer Group had made with other organisations and people, and their generosity to our service. Over the years we have received donations from a variety of people, and after some thought about how to best use this money, we approached Bernard Houston, who composed the song for our group, to help us with a creative project for the women in the group. 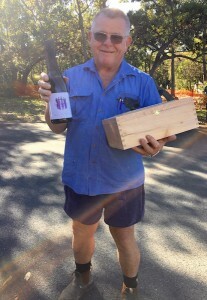 He agreed, and with further funds out of the grant from Queensland Health, we embarked on the project in 2012(?). We decided that the type of box we would use was important. They were made for the women in the group by the Bribie Woodies, a woodworking group on Bribie Island. They are beautifully made, jointed and varnished silky oak. The aim of this project initially was not proscribed, as we thought it would develop as time went along. It became an opportunity for those involved to re-discover and re-claim for themselves some of their own memories from childhood, to share these with others in the group, and to leave memories for their families. It also became a way of connecting with others in the community who were willing to offer their skills to enhance the project. One of the women in the group has found that Sally Hanson’s Hard As Nails, available from the supermarket, has helped ease breaking and splitting nails.